The apparent murder 12 years ago of a small-time crook in a cornfield outside Alton, Missouri, has become one of the F.B.I. 's "top unsolved cases," and in desperation, the agency is turning to the public for help. No sooner did the case hit Reddit and its ilk than they started getting answers. The federal agency got involved because Ricky McCormick's body was found with two encrypted notes, which law enforcement officials think may lead to the killer. But the seemingly random series of letters and numbers have absolutely stumped agents, as well as the American Cryptogram Association, which the bureau has consulted. Now they want you, Internet denizens, to try your hand at the puzzle. And Internet, you responded. Since the agency posted images of the code on Tuesday and newspapers started picking up the story yesterday, quite a few possible solutions have been proposed. 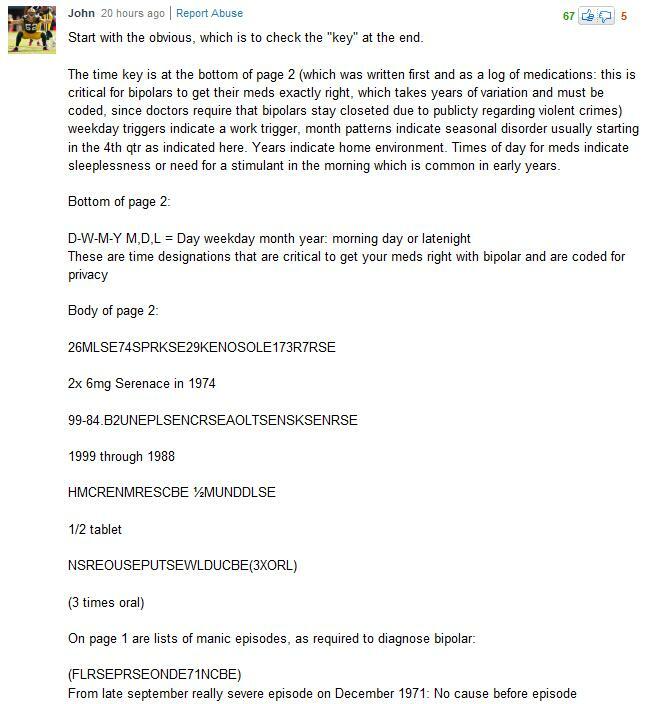 One Yahoo commenter claims it's a shorthand log of medication schedules and psychotic events in McCormick's life, but many on Reddit dismissed that solution out of hand. Rather, that site is dedicating the bulk of its efforts to transcribing the notes so that they can create a so-called brute force computer program to crack it by just plugging in millions of variables. Over at Network World, they're wondering if all those numbers may refer to highways, and if he was planning a trip. It's easy to get sucked into this game, so read these notes at your own risk. If you can read them at all. The handwriting is terrible.